Since NHL was born, almost six years ago, taking care of myself when I am sick has taken a back burner. As a mother, you have to move on and do things through sickness. Basically I often ignore things until they get SO bad. Needless to say I am at the doctor immediately when the boys are sick and need anything. Prior to going to Disney World I was feeling amazing. I had lost almost thirty pounds, was exercising up a storm thanks to Leslie Sansone (and my pedometer), plus I was inspired by others on the same journey. When we arrived at Disney World I was the only one that barely complained about my legs/feet bothering me from all of the walking. My mother noted that the "walking and kicking" with Leslie Sansone had paid off. During our forth dinner at Disney World we ate at The Wave in the Contemporary Resort. We had a delicious meal. Since we were on the dining plan we were able to order a tasty treat for the end. 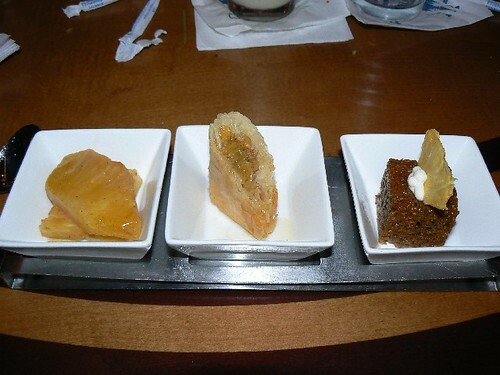 I selected the crunchy trio that included Baklava. I thought nothing of it. After a few minutes I noticed that my throat was itching some. In addition to this, I was having a difficult time swallowing. It was raining out after the meal so we decided to head back to the Magic Kingdom and get a bus back to Pop Century. After the boys were in bed I was still having a really tough time getting air in. I had my rescue inhaler with me and decided to give it a try. By this point I was starting to put the pieces together. I recalled during Passover when I told JL that my throat was itching after I had some charoset (apple mixture with honey and walnuts). Do you see where I am going with this? I hardly use my rescue inhaler and was not used to the new propellant ones. I took my two puffs and then realized I had made a horrible mistake. In taking the medication, I had burned my throat. *sigh* I did not think to use my spacer that was packed and just took it. Lesson learned the hard way. The rest of the vacation I was winded easily, was coughing thanks to my throat trying to get better from the Albuterol burn, and had no energy at night. When we came back from Disney I knew that I had to talk to our doctor about my walnut allergy concern. When I took JSL in for his 2 year check up last week I spoke with the doctor. At that point I told her that I had a physical appointment made with her (have not done that in way too long either). When she heard what happened her reply was "What pharmacy do you go to?" She was already on her little techy machine writing a prescription for an EpiPen into the pharmacy. She told me that I should obviously avoid walnuts now and must always have my EpiPen on me (something I still have to do as it is sitting on the dining room table). This appointment was less than a week after my attack episode. She told me that the cough and everything should go away and give it time. Flash forward to this week. I still had no energy, was winded talking/walking across the room and obviously was not working out with Leslie Sansone. I felt depressed about what had happened since I had come so far. Blogging has been pushed to the side because when I typically blog at night I was fast asleep. I called the doctor’s office to see what I should be doing. Since we were home I was still using my rescue inhaler daily and explained how I felt. They said they would call me back the next morning since the doctor had already left for the day. Yesterday morning they called back. Much to my surprise, the doctor did not request to see me. She called in a prescription for an inhaler to help my lungs rebound. The nurse said that I should feel a difference soon. Last night I started the medicine and it was the first evening that I have not needed my rescue inhaler (of course I had already used it a few hours earlier). Tuesday I did a two mile Leslie Sansone and it felt great, although I was nervous about having an asthma attack. Now I’m hoping that by the weekend I will get back into the swing of things and be up to it. Feeling as though you are gasping for air and have a brick on your chest when breathing is not something I ever want to experience again. Lesson learned – DO NOT ignore your body. I learned the hard way and was very lucky. Now I will be watching for walnuts as I walk and kick my way through life. Wow, I am glad you figured it out! Looks like you guys had a great time in FL! I’ve enjoyed the pics! Renee Garcia’s last blog post..Sibling… Love? Glad you’re feeling better. I’m fairly certain I’ve developed a tree nut allergy too as an adult. I broke out in HORRIBLE hives several years ago, and the only thing different was that I was eating a handful of cashews everyday. I even had them inside my mouth. I’m grateful that I didn’t have the breathing trouble you did. I’ve not been tested but have avoided tree nuts ever since. The hives were enough of a deterrent for me to kick those out of my diet. Hope you never need your epi pen. Sorry to hear about your problems. My cousin just found out that her son is allergic to walnuts as well so now he has to stay away from all tree nuts. I am thankful that you did not have more of a serious reaction to them but any allergic reaction is scary! Aw, too bad! Glad you found out what it was, though.